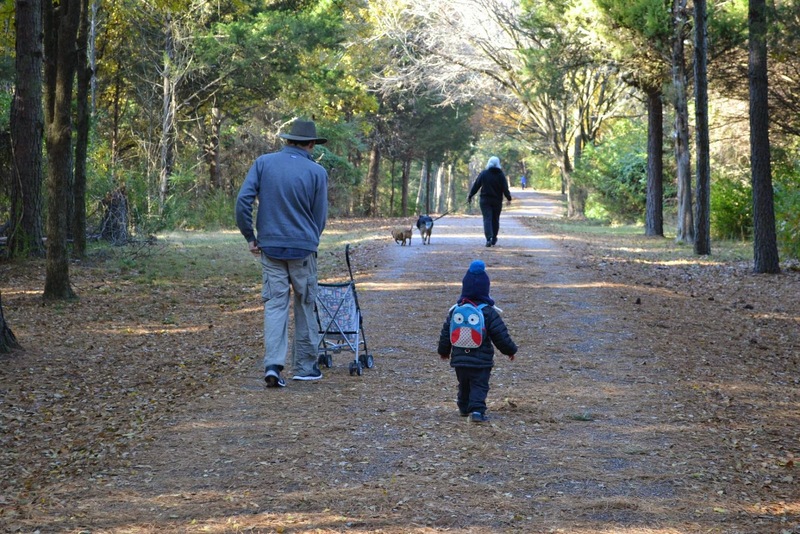 Longtime readers of my blog (hi Mom and Dad) know that Benjamin and I go on a hike on the day after Thanksgiving; it is our way of refraining from over-consumption, avoiding getting trampled, and recovering from any Thanksgiving excess. Since Malcolm arrived, we haven't taken any long or strenuous hikes, but we have made an effort to at least go somewhere we don't normally go for a walk. This year, we headed up to Russellville (about an hour's drive) to try out the Bona Dea Trails. 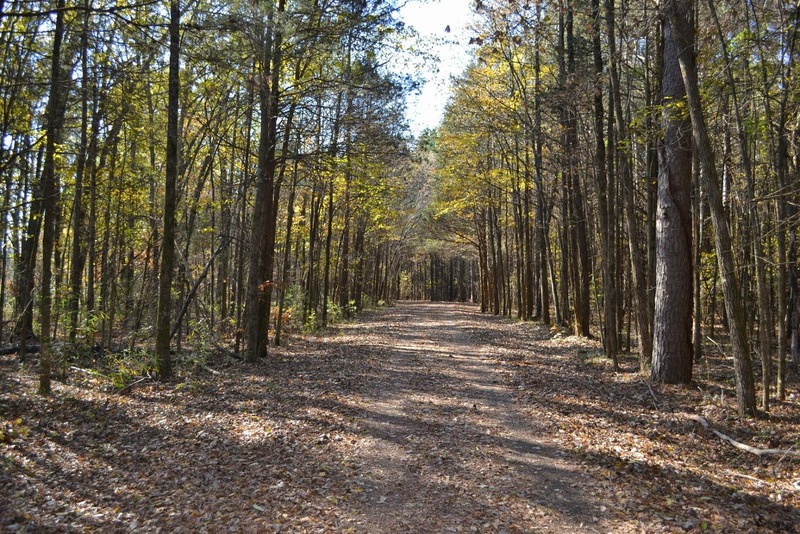 It is a trail system that combines a fitness trail, jogging trail and some hiking (sort of), in the city limits of Russellville. 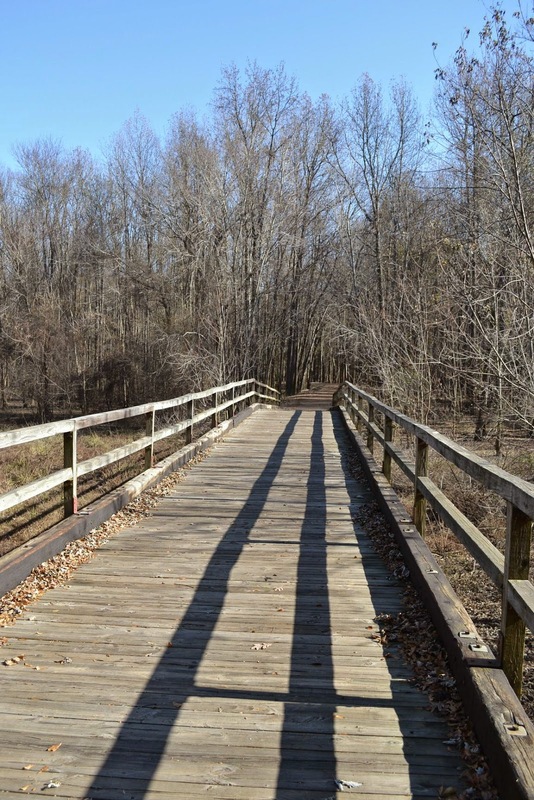 The entire loop (about 3.5 miles) is paved and in good condition, so it is wheelchair and bicycle accessible. That means isn't a particularly difficult hike, but it was a good fit for us at this time, with our toddler, stroller, grandmother and two dogs. It was chilly, but sunny - good weather for a long walk. Malcolm walked at least a mile and a half of the trail by himself. As long as he is in the mood, he is a very good walker/hiker. We all had fun on the fitness parts of the trail, trying out the various exercise stations. The scenery wasn't spectacular, but it was peaceful, and it is supposed to have good wildlife viewing opportunities if you visit near sunrise and sunset. 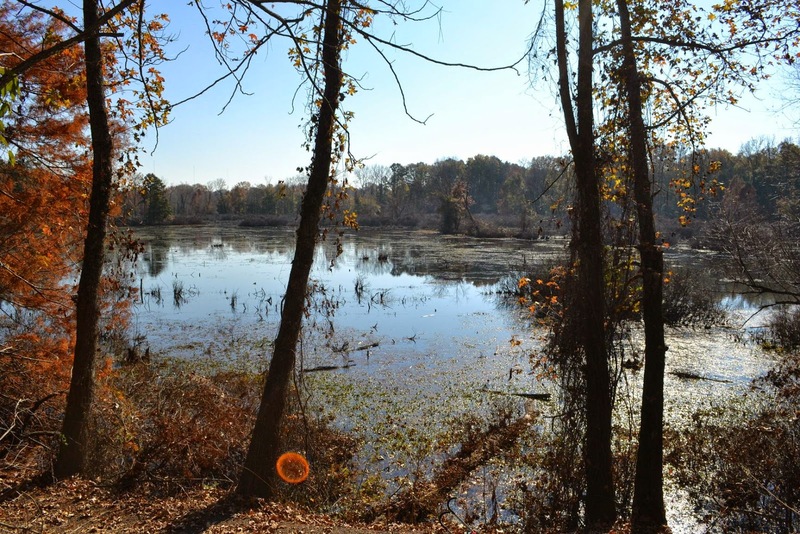 Although I doubt we will make the trip up to Russellville just to use the trails again soon, it is definitely somewhere I would go to run or ride my bike if I lived in the area. It might be worth a return visit when Malcolm is a bit older and can ride his bike around the entire trail.